While much has been added and removed from New York City in the last nineteen years, if you were to judge from this picture it would seem as if even the trees were frozen in time. Almost. 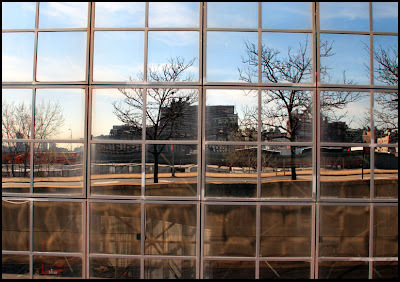 This is the south face of the Jacob Javits Convention Center, and here it reflects West 34 Street between 11 and 12 Avenues. The black and white image was taken in July of 1989, probably on a Saturday afternoon. I spent a lot of Saturdays at work back then, I spent a lot of late nights weekdays, too. I was practically living like a vampire back then; a basement apartment, working 12-14 hour days in a sealed computer room. 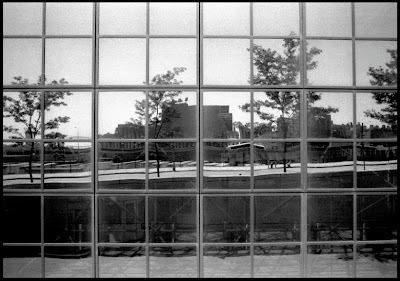 The only time I got any sunlight, it seems, my only shot for some Vitamin D, was walking the two block long concrete wall of the Javits Center fronting 12 Avenue/West Street. As for our second image, if certain politicians and football team owners had their way, the shot from 2007 could have been a very different and certainly much more interesting picture, with the window panes revealing a busy construction site, cranes and dump trucks and cement mixers, all contributing to the birth of a stadium of Olympic proportions. Fortunately, cooler heads prevailed, and the city that can't figure out what to do with sixteen acres of land downtown also won't be tasked with constructing myriad venues for sports that only the Daily News writers even pretend to be interested in every four years.